I’m on a roll with these organic Colorado peaches from my CSA fruit share. Just like with the cherries, I can hardly decide what to do with them next. I started with two good-sized bags on Monday and I’m afraid they’ll be gone by the weekend. These muffins have a subtle, off-beat (as in quirkily good) taste, followed by full-on peach power. Of course, they’re gluten-free, but for those of you who eat wheat cooties, I’ll also make an attempt to adapt backwards so you won’t miss out. In medium sized bowl, whisk together Pamela’s Mix, mesquite flour and cinnamon. Set aside. In a separate (and larger) bowl, whisk eggs and honey until well combined. Gently stir in the peaches. Add the dry ingredients and stir by hand until well blended. Fold in pecans and spoon into lined or greased muffin pan, 3/4ths full. Bake in preheated 350 degree oven for 20 to 22 minutes, or until toothpick inserted in center comes out clean. Makes 1 dozen muffins. * Since I never bake with regular flour, I can’t make any guarantees, but if you want to give this a try with wheat flour, you need to use a leavening agent (approximately 1 teaspoon baking powder and 1/4 teaspoon baking soda per cup of traditional flour). Decrease the flour as I’ve found 1 cup of traditional flour equals about 1 and 1/4 cup of GF flour. For more general tips on exchanges and baking with GF flour, check here. I imagine you could also use a traditional banana bread recipe and substitute chopped peaches for the bananas. * Mesquite flour is a bit pricey, but it’s worth it for the exotic fun factor and the taste. I love the stuff. You don’t need much – in fact, a little goes a long way, so it lasts for months (store it in the freezer). Mesquite has a sweet, chocolatey, coffee, cinnamony taste. Or something like that. I can’t quite pin-point it, but it smells absolutely divine. It gives baked goods a nice cinnamon color — it’s beautiful flour. 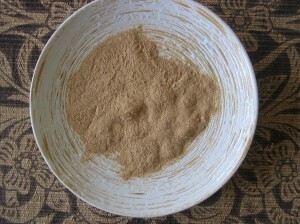 Plus, mesquite is high in fiber and protein and is a good source of calcium, iron, zinc, and potassium. It also helps balance blood sugar levels. Ground mesquite pods were a staple for Native Americans and indigenous people of the southwest. Hmm, what’s next for my peaches? Goat milk peach ice cream? Or peach cobbler? This entry was posted on Thursday, August 13th, 2009 at 1:29 pm	and is filed under Gluten-Free Recipes, Seasonal Foods. You can follow any responses to this entry through the RSS 2.0 feed. You can leave a response, or trackback from your own site. About those peaches: eat them raw! They are so sweet and juicy and your body will love you for it! Cracking post again, Melissa. Good luck with those peaches. Hi, I’m a new follower to your blog. I avoid refined sugar and corn syrup- have for a year and a half. I gave up wheat several months ago and enjoy baking… and love eating locally. So this is a great site for me! Anyhow… I tried the zucchini cherry bread, but couldn’t afford the pamela’s baking mix and tried another gf baking mix… i added a tiny bit of baking soda and baking powder as it seemed there wasn’t much of either in the mix, but otherwise followed your recipe… and it really didn’t taste right. I suspect it is because I tinkered with the flour, etc. And I should have checked with you first. I would love to try these at some point, but right now I only have a Bob’s Redmill GF mix and an Arrowhead GF mix- are either of them an acceptable substitute? Or could you tell me what a homemade combo of flours, leavening agents, thickeners, whatever… would be. I have lots of diff flours in the house. I just don’t know enough about gf baking to do responsible substitutions. Thanks for your creativity and your help! I’m totally with you on eating the peaches fresh and whole! Totally — but that doesn’t make a very good blog post. Wash, eat whole. End of post. So, although that’s how I enjoy them most of the time, I’m also having fun trying some recipes for my blog readers. Although, I have to say, fresh, homemade peach ice cream is hard to beat. Yum! Did you receive any sunburst (scallopini, pattypan) squash this week? I have a recipe I’m going to post, but I haven’t gotten any in my boxes. I picked them up when I was at the farm painting buses. Thanks for the comment — you’re so right. Eat them fresh while they’re juicy and sweet! Yes, our interesting combination of foods, baking talents, and clothing choices will be a sure hit with our customers. Having Miles keep us on track with the right ingredient combinations and GDave greeting people at the door, we’re bound to be successful. That, or a colorful sideshow attraction! Hope the kitchen renovation is coming along as planned. Another laugh-out-loud comment from you. You seriously crack me up. Cooties are things boys have when you’re an 8 year-old girl. If a boy touches you — YIKES, you get boy cooties. I just like that word, so it’s been in my vocabulary since I was about 7 years old. At this point, most people probably have no clue what I’m talking about. Glad you enjoyed it. I suppose it’s a bit “vintage.” I’m dating myself. Thanks so much for your comments and welcome! Hmmm? Lots to think about regarding your flour blend questions. Oh, and I’m sorry the bread didn’t come out right. I’ve been doing this for almost a decade and trust me, I’ve had some monumental bread flops, but I think we can figure this out for you. First off, is there xanthan gum in the blend? You probably didn’t need to add the baking soda or baking powder to the mix. I actually might try it as a direct substitution. I checked the Bob’s Red Mill site (I like their products, by the way), but couldn’t see what the ingredient list was for their baking/biscuit mix. Is that what you used? Many of these GF flour blends that are coming on the market now can be interchanged, but I can’t say for sure without seeing the ingredient list. Here’s what I’d suggest though. See if Bob’s or Arrowhead has a zucchini bread recipe for the mix, then tweak it from there. Add some cherries, switch out the refined sugar for maple syrup or honey. When you do that, you have to be careful of a couple of things though. I could ramble on about the sugar thing — I’ve done many posts on it if you’re interested. I’ll guide you to the links or you can try my search mode, but it doesn’t always work as intended. Anyway, I prefer using honey or maple syrup for a variety of reasons, mainly because I’d rather support my local honey producers or Vermont’s maple syrup producers. Plus, there are some nice subtle taste variations depending on where the honey is produced. I had some wildfire honey a couple of years ago that was unbelievably good. It was made from the blossoming flowers following a serious Colorado wildfire. The plants that were coming back after the devastation. I don’t know what the reasons were, but that honey imparted a wonderful taste to baked goods. Okay, I’m rambling. There are some adjustments you need to make with honey, but often it depends on what you’re making. Honey also browns faster than sugar, so you need to watch that as well. I have a refrigerator full of “alternative” flours and have used everything from bean flour to chestnut flour, but I’ve found since I don’t eat a lot of baked goods, that it’s just less expensive and less effort in the long run to use one of the blends. Authentic Foods has a good one as well. You just have to find the one that seems to work best for you. I like the Pamela’s but my daughter doesn’t because it has almond meal in it (she can’t eat almonds). Luckily there are a host of GF products out there now to chose from. Some good, some not-so-good. Geez…blah, blah, blog! But I hope that helped. “Quirkily good” is always good I think. Your ppm muffins sound very good. Since we just got 4 gallons of honey from our beehive, I’m looking at doing much more baking with honey. I made flourless chocolate banana honey walnut cake last week. Tell us about bee keeping…. it’s the sort of subject that keeps cropping up here in the UK since our bee population has dwindled. Any chance that we can have your recipe for flourless chocolate banana, honey and walnut cake because it sounds delicious? Well it’s the whim. I didn’t get my fruit this week, but I got the patty pan squash. 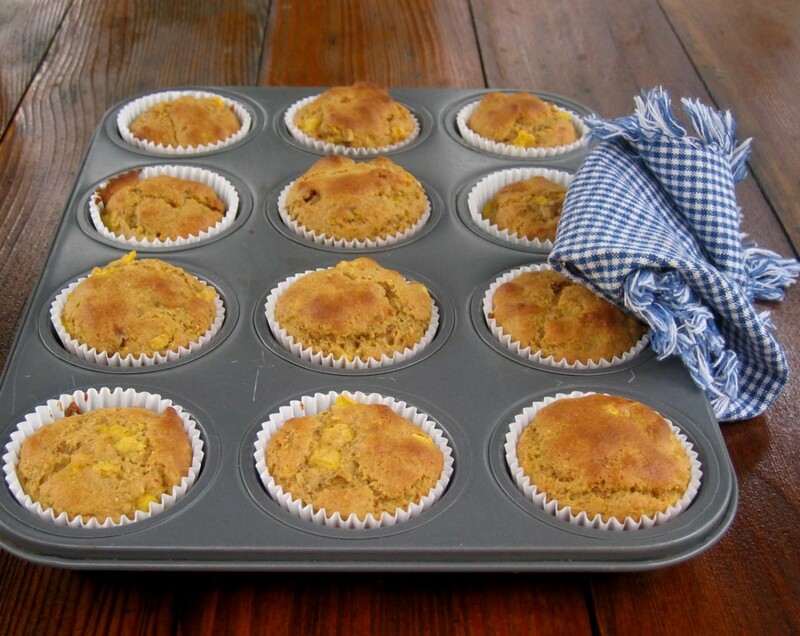 I have frozen peaches from last summer so am going to use my last package of them for these muffins. Can’t wait to make this this afternoon. Yum, Yum. Thanks for giving us such good gluten free goodies to make. Wow — it looks like you have some requests here for your flourless chocolate banana honey walnut cake (include me in the mix). I think you need to do a blog post on that one! I love honey for baking. It really does impart wonderful flavor. I know your comment was directed to Shirley, but I have a question for you. Is Hugh Fearnley-Whittingstall one of your many boyfriends (I think that’s his name)? I saw that he has a book coming out soon (River Cottage Everyday) and it looks absolutely wonderful! Fresh, simple cooking at its best. He’s a UK fellow, right? I don’t know anything about him, but the book looks beautiful. It’s not out yet (October release date), but when it makes its debut in the UK, let me know what you think. Once on Amazon.com, I might have to order it. I pick up my delivery today, so I’ll keep you posted. Wow, do you know why you didn’t get fruit this week? I would have shared mine with you! I’ll post a pattypan squash recipe tomorrow. I also made a wonderful squash fritata the other night. Wish I could just cook and blog about it and not worry about my real job. Hi again all … sorry for the delay in replying. Hosted a girlfriends’ soiree this eve. Since it’s a work night, we had to break it up early though–rats. Cid–Beekeeping is a wonderful thing and many more beekeepers are need, but beekeeping is not for the uninitiated. Many years ago, my late FIL was a pioneer for beekeeping in our area. The best thing to do is to find someone to mentor you through your first hive. Usually they will even give you a swarm to get started, but swarms can take a while to get established, so some folks buy a hive with bees and all. (We get new queen bees annually via the postal service, believe it or not.) Please feel free to email me (glutenfreeeasily@gmail.com) and I’ll share more. Hubby is the beekeeper for our hive and helps his mom keep her 20 hives on the family farm. I’m the partner for bottling, the one who makes patties to prevent one kind of mite, and the baker. Cid, Melissa, et al–I’ll send you the recipe, but I’ll also post it soon on my site … or maybe the 3-minute “to die for” chocolate cake I made this evening. My chocolate cake recipes have been some of my most popular posts on my blog since it began. Thank you for sharing the bee keeping advice…. it all makes sense. I think I see myself as owning a beautiful traditional beehive, (you know the sort you find in Winnie the Pooh ) extracting honey and beeswax and making lots of sweet sented things. The actual tending and getting stung is not part of the scene so I’ll look into this in some detail first. We have a good many products here which advertise Propolis as an ingredient… I understand bees make that too although I know very little about it. Bees are essential that much I do know so well done for keeping so many hives. p.s. kitchen update… walls shortly to be plastered, wiring complete, plumbing almost complete…. work tops ordered and onsite meeting due any minute with Mark (another of my many boyfriends ) the cabinet maker. Thanks, you’re a doll to fill us in on bee keeping and chocolate cakes. Three minute chocolate cake? Are you kidding? You mean I could be eating cake in the same time as it takes for me to reply to this comment? Hugh sounds a bit like our Jim Denevan, but without the sand art and the traveling plate groupies. Oh my gosh — burdock beverage? Introduce me to this man. Cid, I’m serious, some day I’m going to come over there and sit in your kitchen and have tea. I’ll bring my own cup and wear a kimono. Cid–You’ll need to get outfitted, literally, for beekeeping. However, even in his suit with veil, wearing boots, etc., hubby still gets stung occasionally. The guards are just doing their job. The honey is worth it though. Those Winnie the Pooh bee skeps are lovely–just not very practical. Beekeeping the minimalist way is very much desired though (e.g., no heating the honey when extracting/bottling). Propolis is interesting stuff, but it’s not 100% guaranteed to be a good thing. Bees use what’s available to create it and sometimes that’s artificial material. We do have one friend who collects the pollen her bees gather and eats it in capsules daily. I love to use mesquite flour. When we made pancakes with it, I couldn’t get over how “chocolatey” it tasted – which is great for me since I can’t eat chocolate. Here’s to GF muffins, bees and chocolate cake, traveling plates, kimonos and tea at my new table with long distance friends….. what could be more fabulous! You are such a doll. Thanks for all this information — it’s fascinating stuff! I actually remember your flourless pizza and I’m okay with dairy once every so often. Not much though. That 3-minute cake thing is hard to imagine. Oh, but I’m more than willing to give it a try. You can’t eat chocolate??! Oh my gosh, you poor girl. You’re right on the mesquite flour, it does add a lot of sweet flavor to baked goods. I’ve never tried it in pancakes. That sounds wonderful! Thanks for the tip. Fabulous is right! I seriously have a feeling that will happen someday. I can just imagine us all at your table, sipping your creative blend of exotic teas in the morning and having cocktails in the evening (I can’t remember what that liquor was that GDave suggested we all enjoy). All the while, Daniel Craig is hanging out in the corner. Cheers to our virtual traveling plate club! I hope to be able to eat chocolate someday. I love it so. It gives me adverse reactions though, even the purest of chocolates. I have tried raw cacao as well. Cid–I love the imagery you have evoked … if you can visualize it, it can happen, right? I also like Melissa’s addition of the evening cocktails. I tried the beet muffins and I love them so much. However, I am not a chocolate fan so I used carob.They are the best muffins I have ever eaten. Thank you so much for the recipe. Alright, you have now inspired me with your peach muffins! This sounds like a good way to use my peaches!